When it comes to stump removal, there are a few approaches than can be taken. There are so many myths and “simple solutions” that complicated the process because so many don’t actually work. The following is a list of common ways to remove stumps. This is based from experience in the arbour industry and should help prevent you wasting your time. There are a few chemical remover products on the market, most of them are high in potassium nitrate. The product is spread on the stump and it is used to accelerate the decomposition of the stump. There is no product on the market that makes the stump disappear appear in weeks. This process will take months provided you follow the instructions – keeping the stump moist and covered – or it will even take years if it is a palm stump. Another cheaper option is to use a manure that is high in potassium nitrate like cow manure. This will achieve the same results as a chemical product. First drill holes into the stump, fill it with the manure, and then keep moist and covered. It will decompose as fast as nature will allow it. That is, unless you give it a helping hand by burning it – which brings us to the next stump removal method. This is a common method of stump removal but is highly ineffective. It is rare for a stump to stay on fire since it sits deep in the ground and no enough oxygen is supplied to the fire. However, stump burning can work after the treatment of a chemical remover since it causes the stump to be more porus (allowing more oxygen in) and the potassium nitrate will provide fuel for the fire (so to speak). It still comes with a big risk: if you burn a stump you could end up with charcoal material that decomposes even slower than the stump, and is even more difficult to remove. So DON’T DO IT. BUT… If you still have your heart set on burning that stump out of the ground there are a few things you can consider. (Your neighbours should definitely be a consideration!) But in addition to using a chemical additive to make the stump more porous before burning, you can build a makeshift open stove out of a large metal can or bucket, placing the stove over a portion of the stump and let it burn for a time. 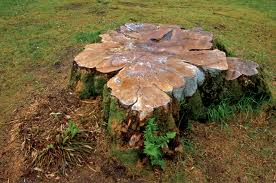 After you are satisfied that the area of stump has been burnt out, you should then move it to another area on the stump until the whole stump is removed. Make sure to remove any charcoal from the stump after each fire. If done right, this method can be an effective way to remove a stump. But generally, it should only be carried out in rural areas such as farms. In the suburbs or the city this is a big no no. We wish there was small caterpillars we could use to remove stumps for us, but grubbing is actually the industry term for manual labour. Getting those gardening gloves out of the shed, grab your crow bar, mattock, shovel, chain saw, and dig the heck out of that stump. When you grub, you need to first dig a trench around the stump to as deep as you can go. From this you need to work in under the stump cutting off the roots and freeing the stump for removal. This can be really hard work and not a job for those with sensitive backs. If you stick at it long enough you will eventually get there. Decomposition and grubbing can be used to get rid of stumps. However, some clever engineer was contracted by an arborists to make his job easier and came up with a stump grinder. This tools are machines who use rotating teeth to grind away a stump to below the ground level. This doesn’t get rid of all the running roots, but it does get it low enough that you can plant a flow garden, or cover it in dirt so natural decay can occur out of sight. Stump grinders can be hired, but it is recommended that you should hire an experienced arborist or landscaper to do this work because it can be very dangerous. Grinding a stump can take an hour or two, but setup and removal might add another two hours onto it. This still isn’t easy work and required a bit of elbow grease, but it is definitely the best option for stump removal. If you’re looking to remove stumps from your property, consider talking to our favourite stump removal experts who can arrange a professional to remove that stump for you in no time and at a fair and reasonable price. If you end up doing it yourself, just be careful, it can be a dangerous task.